(Newser) – When the gavel came down, an anonymous bidder was out $92 million and the art world was up in confidence. The scene unfolded Tuesday at Christie's in New York as work from the estate of late Seattle-area luxury-travel executive Barney Ebsworth was sold, per the Wall Street Journal. 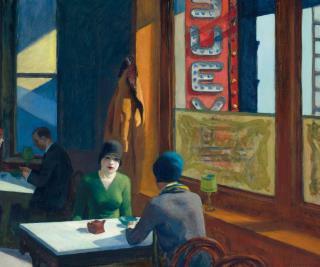 In one of 13 records set for artists, Edward Hopper's 1929 Chop Suey, showing the artist's wife in a Chinese restaurant, sold for $92 million, or more than double the previous $40.5 million record for a Hopper painting. Well above the $180,000 Ebsworth paid for it in 1973, per the BBC, the final price also cemented the painting as the most expensive work of prewar American art ever sold, though Ebsworth had previously promised Chop Suey to the Seattle Art Museum, reports the Seattle Times. Nice rack with the broad in the green! Erm, I mean, what a beautiful oil painting in the social realistic style. Exquisite. My third or fourth favorite Hooper painting. Obviously nighthawks rules supreme.